Joan Arnold – George Russell, D.C. The provocative title of William Broad’s article in the January 8th New York Times Magazine — How Yoga Can Wreck your Body — has a whole nation of yogis buzzing. The news is that people can hurt themselves doing yoga. But they don’t have to. Bring some mindfulness and sound movement principles to your practice, and you greatly reduce your chance of injury. Broad’s indictment is, well, pretty broad. His sensational warning overlooks some essential elements: the wild panoply of yogic varieties, the habits of mind and body we each bring to the mat, the vagaries of teachers’ instructional skills, and the risks that accompany all human movement – athletic or sedentary. What are we calling yoga? 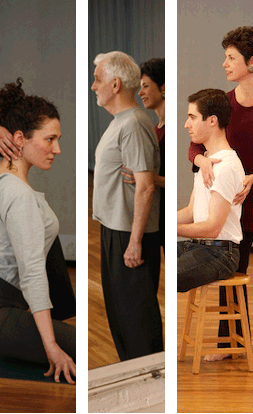 Is it restorative — a few select poses with the body cushioned by props to encourage calm and gentle release? Is it Power Yoga, blending yoga’s whispered influence of British calisthenics with America’s gym culture? Are you performing asanas under the watchful eye of a knowledgeable instructor, or going through your yogic paces in a room of 50 others? Is it Bikram’s sweltering unchangeable routine of 26 poses, each done twice with zero individual feedback? Or is it an innovative class, brimming with anatomical information and a skilled instructor’s carefully chosen words and subtle hands-on suggestions? Yoga is a vast, complex field, practiced or taught badly or well. A longtime teacher of dance, exercise and yoga, I became an Alexander Technique teacher 24 years ago because I saw it as the most fundamental approach to healthy movement, a physical alphabet, an elegant way to help people understand and unravel the chronic tensions that interfere with their comfort, productivity and overall health. I have watched my students bring their own brand of unconscious muscular tension to every activity, including yoga. With many more people doing yoga, more will get hurt. According to Yoga Journal, 20 million are practicing and another 18 million think they should. They hear from a friend or physician that “yoga is good for you,” yet have no idea of the wide spectrum of styles and approaches. For a novice, going to a class is a leap of faith. Injury and pain result when people don’t know how the body is meant to work – with appropriate effort, ease, fluidity and clarity. That’s what they come to learn. If the teacher is performing rather than observing the class, they won’t give the specific feedback essential to a student’s progress. How can you open your hip joints if you don’t know where they are? There are other reasons that yoga can challenge the hopeful beginner. Yoga’s popularity means that the class you attend will be shared with a multi-level crowd. Studios and fitness centers make money from high volume classes, so even the best-informed, well-meaning instructors can only lead, not teach, the group. That can make for a dynamic experience, but individual guidance is impossible. The sweat flies and you’re on your own. The best teachers help their students modulate their efforts. They help them slow down when they rush. They thoroughly warm the body, break down the elements of a new posture and calm students’ unreasonable expectations. They help them smooth ragged breathing and offer props to help them adjust to their limitations, guiding them to build flexibility and strength gradually. They help students build the most crucial psychophysical skill: awareness. Most injuries result from a lapse of awareness. We compare ourselves to others and, in striving to compete, strain beyond our current range. We look at a picture of an accomplished yogi and think we should look like that. What some call “ego” can lead to an obsessive, extreme asana practice. Broad gave the example of someone who sat on flexed feet for hours in vajrasana and ended up with problems walking. Yikes! You can bet that this yogi ignored his body’s distress signals for a long time. And if someone’s ribs pop out during a spinal twist, that practitioner has abnormally mobile joints or is just working way too hard. Lack of awareness can also come from the teacher. An instructor’s uninformed, aggressive manual adjustment can push you into an unnecessarily extreme range, causing injury and discouraging you from a potentially beneficial practice. One instructor pulled a friend of mine up into the deep backbend of a wheel before his back was pliable and his hip joints open. He spent the next few weeks recuperating and avoided yoga class for a year. Now, with the all the necessary preliminary increments, he can counter the hours he spends at his desk with this exuberant, uplifting pose. Props – widely used in most classes – can help. Broad says that noted teacher Iyengar recommends shoulder stands with no prop on a bare floor. This is ludicrous. Any informed yogi knows that Iyengar created the use – some say overuse – of props to help each student accommodate to increments of strength or stretch. Go to any Iyengar class, and you too will be dutifully folding your blanket and arranging your props, learning the detailed method that has inspired many other branches of yoga. A great support for the new yoga student is the Alexander Technique. All people, including yogis, should learn this method’s accessible, simple principles. F.M. Alexander, to solve his own chronic vocal problem, created a comprehensive approach to the integrated use of the human body. He realized that a light, free relationship between the head and the neck restores the spine’s resiliency, making all movement safer and more harmonious. He called this relationship the primary control, and it is a powerful tool in solving our epidemic of back problems, one reason people come to yoga. When the neck is free, the spine responds. Extreme neck flexion does not have to accompany any yoga pose. Using the Alexander Technique, we can avoid serious injury by avoiding the extreme neck flexion or extension that puts undue pressure on the entire spine and can cause back problems and spinal injuries. In a sweeping generalization, Broad writes that experienced yoga practitioners encourage extreme neck flexion. But the Technique has already influenced yoga, and recently I have heard teachers use more cues to coach their students toward an easier head/neck relationship. For example, you can do a classic cobra with a slight, graceful arc in the neck, distributing support and effort through the entire spine. Students without this insight can crunch their heads down on the spine in any pose, not just a wheel or a shoulder stand. In fact, people have gotten strokes from extreme neck extension while having their hair washed before a haircut. And you don’t have to do yoga to acquire back or shoulder problems. You can be sitting at your desk. Just by hunching over your computer, you can develop stenosis, herniation, sciatica, severe back pain, repetitive wrist strain, chronic headaches, neck and shoulder injuries. One of my former clients threw his back out turning a page of the New York Times. When he came to me for Alexander lessons, we spent the next few months exploring and undoing the chronic tension that preceded that injury, and he learned from it. People need to learn how to move well, whatever they do. Fitness fads come and go, each with their own risks, rewards and lessons to be learned. In my years as dancer and inveterate exerciser, I’ve joined most of them . In the early 70s, when Kenneth Cooper touted aerobics, I donned my Adidas and ran until, 25 years later, my knees said No more! I became a personal trainer and exercise instructor in the 80s. I taught high impact cardio classes, jumping around to the Pointer Sisters. When fitness buffs’ knees cried out, along came low-impact cardio. When people bouncing along with Jane Fonda injured their hamstrings, we learned that bouncing makes the muscles contract rather than stretch. Now we’re learning that extremity, obsession, competition and inadequate instruction don’t foster a healthy yoga practice. Since physical labor went out and a sedentary lifestyle came in, as a culture we have been conducting a long, varied experiment in exercise. And some of the people Broad describes have learned, the hardest way. The beauty of yoga is that it takes us desk-sitters and moves us through a full range of motion. We have time to focus on our breath, to find much-needed relief from our hyped-up lifestyle. We join with others who share a common purpose – to explore, stretch the mind, move the body into new realms, to feel the pulse, oil the creaky joints and clear the mind with a fresh infusion of oxygen. How many times have we – students and teachers – been transformed by the experience? Our challenge is to make yoga a contrast to — rather than an imitation of — our nutty culture. As yoga teachers, we must watch our students and make sure that we help them unravel harmful muscular constrictions as they move. I have taken wonderful yoga classes with teachers who continue to refine their understanding of the body, the self and this integrative practice. Using the Alexander Technique, I have guided students from teenage to elderly to practice safely and appropriately – for their age, fitness level and individual challenges. Every yoga practitioner can benefit from learning Alexander’s principles of natural breath and ease in movement so they can incorporate them into a safer, more life-enhancing practice. And really, it’s not what you do, but how you do it. Not everyone has to do yoga, and I hope this fear-mongering article doesn’t stop a curious novice from finding a good teacher and giving it a try. We are stressed out, over-medicated, overfed and electronically bombarded. Yet more and more people find relief from our shattered medical system in the current flowering of body disciplines. Yoga is one, Alexander Technique another. Together they create a synergy, a healthy, expansive way to move through your life, that helps us lift our gaze from the screen, redirect our focus, and restore our natural buoyancy. Blending these ancient and modern arts can teach us how to best use the amazing bodies we’ve been given.